The 2016 Gnu Eco Impossible brought back all the fun of the old Impossible Series board and after only a few turns it won us over. We aren’t 100% sure but it seems like the 2016 has a more stable profile than the 2015 model and that made all the difference with us. Approximate Weight: Felt normal to a touch on the light side. On Snow Feel: Much more stable between the feet than the Impossible we tried the year before. Maybe we just got a demo board in 2015 with too much rocker between the feet but this 2016 model feels just like the 2014 Impossible Series which we loved. It’s still not perfect in harder snow but it’s now mostly stable in all but firm conditions. The 156 felt just right for Mine and Peter’s Size 9 and 8.5 boots and was a perfect but the 160 would of been a better call for Jimbo’s 10.5-11 boots. Powder: Not going to be as floaty and easy as the 2015 we tried with the extra rocker but we still love the float the 2016 Gnu Eco Impossible. It’s just like the 2014 that we loved for a twin shape. It’s no directional floaty champ but does a good job for a twin. Turn Initiation and Carving: Really fun to turn. The Gnu Eco Impossible is the kind of board that’s pretty easy edge to edge but also doesn’t feel too easy so it’s fun. Short radius turns seem snappy and quick and medium to wide radius turns are pretty fun with a little spring going on. Now carving isn’t perfect but it’s very doable for a board with a mellow camber at the tip/tail. Speed: Not bad for picking up some speed on the mountain and it’s got a pretty good feel making speedy turns. Uneven Terrain: You know it’s not that bad for it’s flex and in the little bit of sloppy terrain we encountered it did a great job. Edge Hold: Love this mellow Magnetraction for softer snow. It’s not as good in hard to icy snow like more aggressive MTX but it works in hard snow but really shines in medium to soft snow. It’s not grabby like MTX. Flex: Nice mediumish flex that can butter very well and also snap well off the tip/tail. Switch: Perfect! 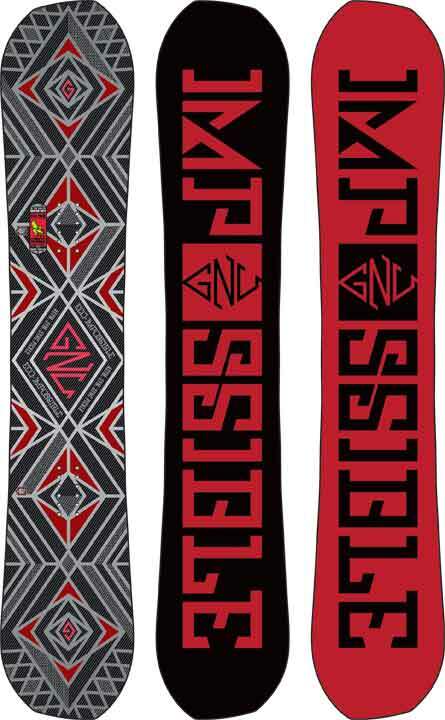 Asymmetrical Twins like the Gnu Eco Impossible seem to make turning easier but even more so make riding switch easier. The only caveat is you are committed to a duck or very close to duck stance to utelize the Asymmetrical tech. If you don’t ride this duck it won’t work that well. Pipe: It’s not perfect but really fun. Very forgiving and it’s got enough edge hold to be ok in an icy pipe. Jumps: Love the pop from this board and it’s got nice ollie power. Also it’s a great board for hitting kickers. So all in all the Gnu Eco Impossible Series is one of those boards that really allows you to enjoy the mountain as well as the park. It’s a nice step towards the mountain side of riding over the Gnu Space Case. For example the sweet spot for my specs with the space case is 153 and the Eco Impossible is 156 so you get a little more mountain power. The Gnu Eco Impossible has a little tech from the now discontinued Impossible Series or the Eco Genetics but rides like neither board. When I first looked at it I was expecting the same stable ride from the Impossible series but it’s really like neither of the boards that it got it’s name from. It’s a much more loose poppy board than before that’s neither good or bad but just different. Conditions: About 3″ of Powder with some groomed runs and some messy dust on crust runs. There was the occasional area with a little wind loading. Approximate Weight: Felt normal to a bit on the light side. On Snow Feel: Very loose like the old BTX boards between the feet. It doesn’t one foot super well or flat base well either but it’s very buttery, really catch free and playful. It’s a huge departure from the Impossible Series and a pretty far departure from the Eco Genetics as well. Both of those felt more stable between the feet and the Impossible Series was the most stable of the three. Powder: Now we only had about 3” or more of powder trying this but we could tell this is one of the better twins in the line for riding the deeper stuff. That big rocker bend in the middle with mellow camber is going to keep the tip and tail afloat. My guess is this board is designed primarily to be a solid powder twin. After some post video discussion we both felt we’d like this board in deep powder. So as a powder twin this is one of the better ones out there but compared to a set back directional hybrid rocker board it’s not going to have the same easy float. If you ride switch in powder a lot you will really like this ride. Turn Initiation and Carving: There isn’t much camber going on in the tip and tail and it almost feels like it’s a BTX board. Carving wasn’t the Eco Impossible’s best quality. I liked the Eco Genetics and Impossible series better here. Actually the Impossible series was the best of the 3, the Eco Genetics a close 2nd and the Eco Impossible a semi-distant 3rd. For turning its very quick and easy. Wherever you want the board to be it will go there. Speed: There can be a little chatter on hard snow and we felt this a little on the wobbly side when picking up speed on Groomers. The base is nice and fast though and has a good glide to it. Uneven Terrain: Pretty quick and easy through bumpy snow and it’s a fun board here. Edge Hold: Grips well and it holds in hard conditions but the .5 MTX isn’t like regular Magnetraction. It doesn’t grab in soft snow but also doesn’t grip really well in ice but most of us don’t ride ice so the mellow mag is better for a board that’s better in soft snow any ways. Flex: Medium to medium soft flex. Jibbing: We didn’t jib with this but it feels like it could be competent here. I would rather ride something a little flatter and more jib friendly. Pipe: No pipe where we demo’d but not the best for driving from wall to wall. It’s a little too loose for my taste in hard pipe snow but its far from the worst pipe board. Jumps: This is where the Eco Impossible shines. It’s got loads of pop between the feet and really springs. It was really fun looking for little bumps to launch off. We had a blast here. So all in all the Eco Impossible is very much a powder and Jump oriented Twin that’s pretty fun but just not what we expected. I personally liked the Eco Genetics and Impossible Series better for all condition riding but this definitely has an advantage in powder and is more poppy. Once I got past my pre-conceived notions from the boards it’s named after it was a pretty fun ride. We try to get as many images of the Gnu Eco Impossible, but forgive us if they're not all there. Wa wa wee wa waa! I love tinkering around with new tech, and always find myself going through gear (sometimes too quickly). This is a board that I had my eye on for a while, and with the recent price drop (still not cheap), I just had to snag one. I have approximately 5 full days on the Impossible, with varied conditions, from hard pack and icy (unfortunately), to light pow and slush. This board eats it all up. I typically find boards with more flex, tend to chatter apart beneath my 200 lbs. This board is actually quite good (I'm on the 160 - I typically ride 162 to 164). You can butter down the entire mountain and hop off of everything with very little consequence. A real confidence booster. It also carves quite well, and I've seen 75-80 km / hr on my GPS (dont know how accurate it is). This was purchased as my "play board" (given it's flex and my weight), but I've found it can carry speed quite well too, and easily hit everywhere on the mountain / trees / and a few laps through the park, with a very snappy / poppy feel out of the tip and tail. I didn't buy it to be my bomber, but it is pretty darn good if the conditions are not suuuuper choppy. Other boards in my quiver:. 1. Rossignol XV Magtek - Leaves trenches that causes children to fall, and parents of said children to become mad. 3. Lib Tech Banana Magic - If I could marry a board, I would marry this. 4. Gnu Eco Impossible - my playful mistress, but has other qualities too. If you're looking for snappy, poppy, playful, carvy, surfy, with minimal consequence - this is the board to have. (at least for me).